OXFORD, Miss. 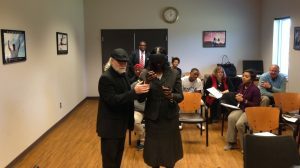 – The McLean Institute for Public Service and Community Engagementat the University of Mississippi has partnered with the Newton Municipal School District to introduce virtual reality education in the state. The school district recently hosted staff from the McLean Institute and Lobaki Inc. of Clarksdale to showcase VR education to staff and students. Bruce Ware, a McLean board member and Newton county native, has been instrumental in engaging the Ole Miss community with the school district for several years. Thanks to a financial gift from a UM alumnus to the McLean Institute, a system was installed at the Newton Municipal School District at no cost to the district. “As an alumnus of both the University of Mississippi and Newton High School, it is incredibly encouraging to see these two organizations partnering together to benefit high school students in Mississippi,” Ware said. “I think that rural public school districts are often the last recipients of this kind of technology. VR education places students in Mississippi at the forefront of schools in the United States and around the world. With the addition of the system, Newton Municipal School District is likely the only district in the state functioning at a such a high level. VR topics include history, health and biology, art, space, molecular science, mathematics, geography and relaxation. The collaboration began with a phone call from Clifton Taulbert, a Pulitizer-prize nominated author from Washington County. Taulbert contacted J.R. Love, project manager for the Catalyzing Entrepreneurship and Economic Development initiative at the McLean Institute, about collaborating with Lobaki Inc.
Love connected the McLean Institute to the firm, which operates a VR academy for high school students in downtown Clarksdale. Over the past several months, representatives from the two groups have travelled to school districts throughout Mississippi to give high school faculty and students a virtual reality education experience. A key community member in helping the McLean Institute partner with the Newton Municipal School District is Randy Cuchens, a local minister. The guiding philosophy of the McLean Institute is built on the legacy of Vaughn Grisham, inviting local people to be change agents in their communities. Cuchens, minister of music and senior adults pastor at the town’s First Baptist Church. “As a concerned citizen, it is my personal desire to do my part in helping students reach their maximum potential and fulfill their mission in life. VR education is beginning to grow on the Ole Miss campus as well. The university’s Center for Math and Science Education recently installed three VR systems at its Jackson Avenue Center location. The McLean Institute is exploring the possibility of a VR workshop for high school students on the main campus. For more information, contact the McLean Institute at mclean@olemiss.edu or 662-915-2052.